See our: Art Deco jewelry. 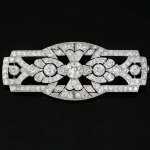 The Art Deco style is a very famous and popular art movement that had a lot influence in the world of jewelry. Art Deco was introduced in the 1920s as protest against Art Nouveau. Art Deco ended in the 1930s. The style emphasized a very abstract design with geometric patterns and as most favorite colors: black (onyx), blue (sapphire), green (emerald), white (diamond) and red (coral). The baguette and emerald-cuts, which had been developed in the nineteenth century, where very popular in the 1920s because they blended so much with the geometrical lines of Art Deco. Most of the Art Deco jewelry has a very luxury design. This is because of the large amount of money that was made in the war of 1914. All this money gave the opportunity to buy the best fashionable materials like: diamonds, platinum, red gold and yellow gold for the design of the jewels. Of course there are a lot of beautiful but less priced jewels in the Art Deco movement. Years later in the 1960s and 1970s Art Deco came back as a very popular decorative art. Even nowadays you can see that Art Deco has great influence on our designing in all kind of branches. We are most proud of our beautiful collection, which contains a large number of Art Deco jewelry in various price ranges, all of them in a very good condition. Adin invites you to take a trip in the 1920's Art Deco movement.